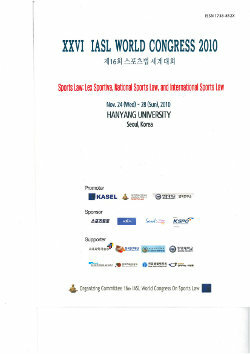 Organizing Committee 16th IASL Congress On Sports Law, IASL 2010, Seoul, Korea, ISSN 1738-852X, 820 p.
The main topic of the XXVI IASL World Congress that took place in November 2010, in Seoul, Korea, was “Sports Law: Lex Sportiva, National Sports Law, and International Sports Law”. The above mentioned Congress Proceedings are divided in two parts. The first part entitled “Sports Law in the World-Present and Perspective” includes several reports concerning Sports Law in different countries as well as the eventual conflict of norms that may appear. -Sports Jurisdictional Order (Who is the Sports Judge, Arbitration of Sports Disputes, Applicable Law, Acquisition, Sale & Movement of Sports Franchises in a Global Environment and Athlete Rights Issues).